In the Annapurna range of the Central Nepal Himalaya lies Tilicho Tal (lake), at 4,919m one of the highest of its size in the world. Stretching about 2.5mi / 4km long and about 0.6mi / 1km wide, it lies at the foot of the 23,400' / 7,134m summit of the same name, north of the Grande Barriere a 10km / 6mi long wall of rock, ice and snow. This tarns-Himalayan adventure begins with a spectacular flight from Kathmandu/Pokhara up the Marsyangdi valley to the airstrip at Hongde, in Manang district. We soon leave the lodges on the main trail to head up toward Tilicho Tal. These high Himalayan reaches are the habitat of the Himalayan tahr (mountain goat) and the snow leopard, among other mammals. From our camp by the shores of the lake, we climb up to the Mesokanto La (pass, 16,730' / 5,100m) where we are rewarded with the first views of the Kali Gandaki valley. We descend to stay at the charming Thakali village of Marpha. Here on we follow the Kali Gandaki upstream to Kagbeni, and up a side valley to the shrine at Muktinath, sacred to Hindu and Buddhist pilgrims alike. The trip ends in Jomsom with an early morning flight to Pokhara. This is a splendid summer trek, as rewarding as it is challenging. 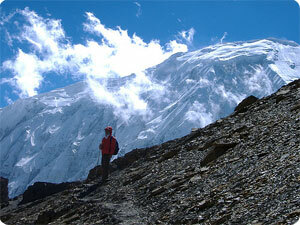 The Tilicho lake trek is among the finest serious Nepal treks best experienced in the Monsoon. Mode of trekking tour: Camping trekking only. Day 01: Arrival in kathmandu 1334m, transfer to hotel , Tilicho pass trekking briefing with officially arrangements. overnight at kathmandu hotel. .
Day 02: Trek permit preparation day. Evening briefing. Day 04: Trek to Baundada (1310m). Day 05: Bahundada to jagat (1430m). Day 15: Tilicho lake to Mejo Khandala. Day 18: Jomsom to Pokhara by flight ,short sightseeing in pokhara valley. Day 21: After breakfast, Relaxing/shopping with own activities than drop to Kathmandu international airport for onward journey.